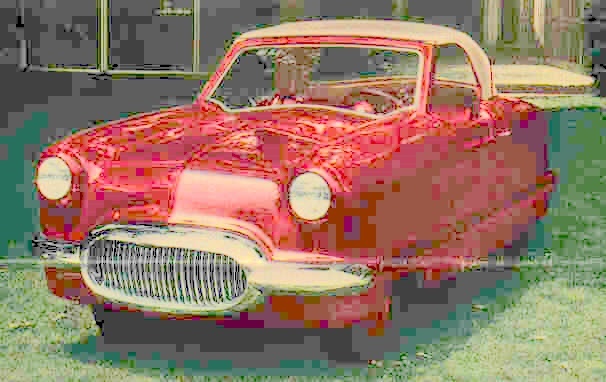 In 1950, the Nash Motor Corporation, one of the leading independent US auto manufacturers, decided to test public reaction to a new small car they were considering putting into production. This was a revolutionary concept in those days of big gas guzzlers. They issued a questionnaire pamphlet called a "surview" showing pictures of a prototype concept car, based on a design by independent auto designer William Flajole, with a reply-paid envelope for people to return their opinion on the car. Quite an innovative strategy for the time. The reaction to the surview convinced Nash that there was a market for a new small car. Since no US auto factory had the tooling or experience to build cars of this size, it was decided to produce the car in Europe. The Austin Motor Company was at that time the largest car manufacturer outside the US, and was an obvious choice, in view of their reputation for quality build and engineering. 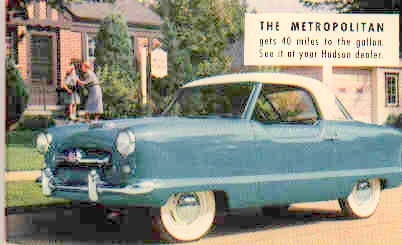 Following various design modifications, the first Metropolitans rolled off the Longbridge production line in October 1953, and went on sale in the US in the spring of 1954. Early versions were fitted with the 1200cc Austin Somerset engines and are now easily recognisable by a "floating bar" grille, and monotone body colours for body and roof. None of these early cars were released on the home (UK) market - the entire production until 1957 was for export only. By the time the first Metropolitans arrived in America, Nash had merged with another independent auto maker, Hudson. 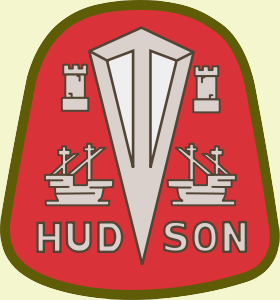 Metropolitans were badged as either Nashes or Hudsons, depending upon which dealer sold them. 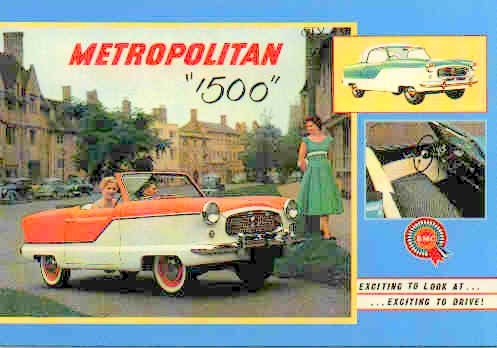 When the Metropolitan was released on the home UK market, in 1957, it had already earned millions of vital dollars for the British car industry, and was reputed to be second only to the Volkswagen Beetle in terms of volume car imports to the States at that time. The engine had been upgraded to the proven BMC "B" series 1500cc unit used in a wide variety of other BMC cars, which had a power output of around 55bhp, giving quite a lively performance in such a light-bodied car. 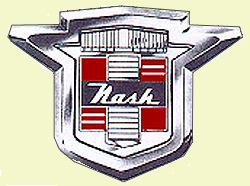 The car was not known as a Nash in the UK though it is sometimes wrongly referred to as such. UK-supplied cars are correctly described as Austin Metropolitans, though they join the ranks of a minute number of cars produced in the world which do not bear a manufacturer's badge. The above picture shows a homemarket Metropolitan 1500, and is taken from a publicity brochure shot on location at the Cotswold village of Chipping Campden. From 1957 on, all cars were duo-toned with white, with the main body colour ( red, green, yellow and later black) separated by a stepped stainless steel moulding. The Metropolitan was to stay in production until 1961 with only minor changes in 1959 to accommodate an opening boot lid, one-piece rear window and quarter lights in the doors. Today the Metropolitan is a rare sight on British roads, although they continue to be plentiful in North America, the true source of the inspiration for this remarkable little car.